The house in Japan Kansai is small compared to our home in Nishijima, but it has all the facilities we’ll need during our time there. In many ways I enjoy the coziness of the little house with the sounds and salty smells of the ocean just outside. This is a wonderful getaway for us, even though comfort is not our goal. Soon we must meet the members of the community and the castle. Our new home is small, but just right for our purposes. That first night was nice, the ocean was quiet and we enjoyed the moon hovering again over us. I wondered to myself, why does the moon love us so? On that first night, Takamatsu and I rested from our journey, but by the morning our long evening of exploration had left us both unwilling to wake. The mild weather from earlier turned at night, as winter winds blew in from the ocean and we could feel them penetrate our little house. Our bed is very small and throughout the night I found myself snuggling up underneath my husband for warmth, but also to keep from rolling onto the floor. (/me giggles) He snorted a couple of times as he tried to get comfortable, but let me borrow into his warm body. Finally, as the Sun filled our little home with light and warmth, I rose and added wood to the fire pit in the main room, then boiled some water for our morning tea. The day before, I had taken time to perform the mochisuki ceremony, making a small batch of rice cakes sweetened with red beans. I brought two of the fresh cakes with us in my travel pouch, expecting only a small meal during our journey. Fortunately, we had shared the first cake but saved one for our return to Nishijima. So, we had a second rice cake for our breakfast. When my sleepy husband finally rose for the day, the room radiated smells of hot tea and sweet breakfast. As he settled with me by the fire, we talked about our next steps for becoming part of this community. Interestingly, our home is near the town’s okiya, Nakanoshima. This okiya was known to me in the past because when I was an apprentice geisha, a maiko at Little Yoshiwara okiya, my first imouto left our okiya to join Nakanoshima. And also, my own onesan had moved to this okiya as well. After breakfast we decided to explore. We entered the compound of the okiaya and even though the ochaya was not open yet, we stole a peak of the lovely teahouse. We did not have much time for engaging the people of the community, but my husband felt the teahouse of Nakanoshima would be a good place for him to blend into the town in the coming days. For me, I was interested in exploring the stores that fill the town. But all of these things would have to wait because we had things to do in Nishijima. 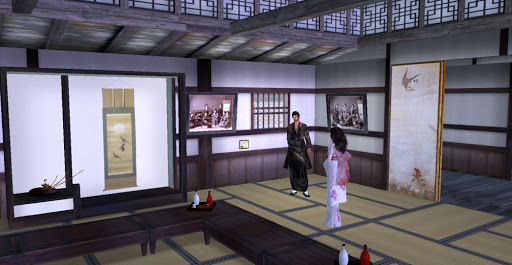 This entry was posted in Writing and tagged Adventure, Friendships, Geisha & Samurai, Role Play, Second Life, Stories, Writing. Bookmark the permalink.